Express Car Care Answer: Signs of brake problems often fall into one of two categories for Denver motorist: making noise or a pulsation in the brake pedal. Let’s start with the noise. Most brake pads have an audible brake wear indicator. This is a small piece of metal that rubs on your brake rotor when the brake pads are worn to the point they should be replaced. The noise is a chirp or soft squeal. This noise gives Denver drivers enough essential warning to get their brakes serviced while there is still enough brake pad left to enable you to stop safely. 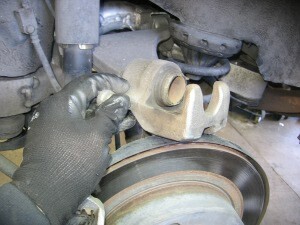 Motorists who ignore the chirp commonly find that the sound changes to a grinding noise. That is more serious. It means that the friction material on your brake pad is worn away and metal parts of the brake are grinding against the rotor when you press on the brakes. Obviously, this harmful metal-on-metal means that your brakes aren’t stopping very well. It also means that your rotor is being damaged. It may need to be resurfaced or even replaced. Pedal pulsation is another noticeable problem. When your rotor is not in perfect alignment, it pushes against the brake pads unevenly as you apply the brakes. There could be a number of reasons for this. The rotor and wheel hub may not be mating well, causing the rotor to be spinning out of vertical alignment. This harmful misalignment can be caused by either the rotor or the hub, or a combination of the two. If this issue persists, the rotor may even start to wear unevenly to the point that its thickness varies, causing an even more noticeable pulsation. This uneven mating of the brake pad and the rotor when braking means less contact and it will curtail braking power. Your service center or the team at Express Car Care in Denver can determine the cause of the harmful misalignment and remedy the trouble. Either unusual brake noise or pedal pulsation are signs for Denver car owners that there are brake problems. Motorists should have a tech at Express Car Care survey their brakes thoroughly and recommend any critical steps necessary to correct the issue. A regular brake inspection is on every vehicle’s recommended list. Ask your helpful service professional if it’s time for an important brake inspection. Thanks for the tips! I’ve been trying to figure out if I need to have my brakes fixed. They still work pretty well, but I’ve noticed that they’re a little bit weaker than they usually are. I didn’t realize that noise or pulsations in the brake pedal are signs that I should have my brakes looked at. My brakes have also been making some really weird noises as well as pulsations. I’ll be sure to have them looked at now that I know that there may be something wrong with them. This is really good to know about the brakes and the care to be taken regarding the car. Proper guidance. Thanks for sharing! My brakes have been making noises for a couple of weeks. Earlier this week I started to feel pulsing in the break pedal as well. I guess it’s time to get my brakes checked. Can you tell me how likely it is that the brakes will have to be replaced completely? I don’t know whether or not replacing brakes is common, or if it’s possible to just do a small repair and not have to make any replacements. Thanks for sharing this. I noticed a little bit of a squeaking sound when I started braking this morning on the way to work. Hopefully that just means the brake pad needs to be replaced. I better take it into a repair shop soon so that I can be sure that my car isn’t making noise because of a bigger problem. The last time I had my brakes replaced was because I was terrified of the pulsing noise/sensation when I stepped on the brake pedal. It took me a while to realize what the problem was. Thanks for the post. Thanks for sharing this valuable article on brakes. I learned several things from the ideas you described in the post. I will take care of the brakes effectively now.